Math Mini Courses Online from A+ Interactive Math are affordable and excellent way to close learning gaps in particular areas of Math where students may have weakness. Each mini course covers a logical group of specific math concepts from several grade levels. It offers an in-depth review of math concepts from a very basic to a more advanced level. Mini Math courses help build a strong foundation in Math by providing students with consistent review of the specific areas in which they're weak. There are a total of 20 Math Mini Courses available Online from A+ Interactive Math. 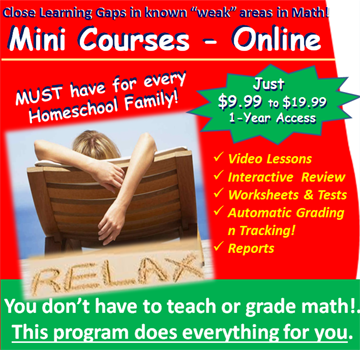 Each Math Mini Course provides 1 year access online for a very affordable price of just $9.99 to $19.99. Most students can complete each mini course in 2 to 3 months, however, you will have access to it for a full 1-year if you need to go back and review. Multimedia Lessons that teach math concepts with fun, colorful and engaging computer animated video lessons, audio and text. Interactive Review for each lesson that helps students/parents identify and close learning gaps. Worksheets that provide extra practice to help master each math concept. Solution Guides that provide detailed step-by-step solutions with visuals to each problem on worksheets. Full text versions of lessons that provide additional flexibility for those who like to read through the lessons. Printable worksheets and tests for practice offline.